Hey gals and guys! Today is a special one (see what I did there?) because I’m releasing into the world my Best Of, ‘The Special Ones’! It really has been quite a crazy ride back through memory lane putting this together, going over old recordings and footage. I’m finding myself feeling even more grateful for everything and everyone out there who has got me to this point. And don’t worry I’m not about to stop, I’m hoping in another 20 years there’ll be a Best Of #2! I still have a whole lot more to say, whether people wanna hear it or not, ha! New track ‘Run So Fast’ ft. Ben Abraham is on the album, along with my other new song Arrows, the VERY FIRST demo of All For Believing, and a live version of ‘Throw Your Arms Around Me’ from my performance at Etihad Stadium. I hope you love this collection of songs and they mean something special to you like they do to me. Listen to ‘The Special Ones’ here. Also, this Sunday at 8:40pm my show at the Melba Spiegeltent for Ausmusic Month airs on the ABC! I was joined by a superstar lineup of friends: Dan Sultan, Kasey Chambers, Ladychoir, Peter Garrett, Gretta Ray and Ben Abraham and it really was sooooo incredibly special. My mum and husband were in the audience and even got a bit of airtime, much to their surprise! I hope you love watching it, it really was an honour to be a part of. Next up for me is the Coming Home tour with John Butler Trio+ in Jan/Feb next year which is gonna be awesome!!! Tickets selling fast but some are still available here so get in quick! Really looking forward to these shows with John, we go way back and there’s a lot of mutual respect there. I hope to see your lovely faces in the crowd somewhere soon. 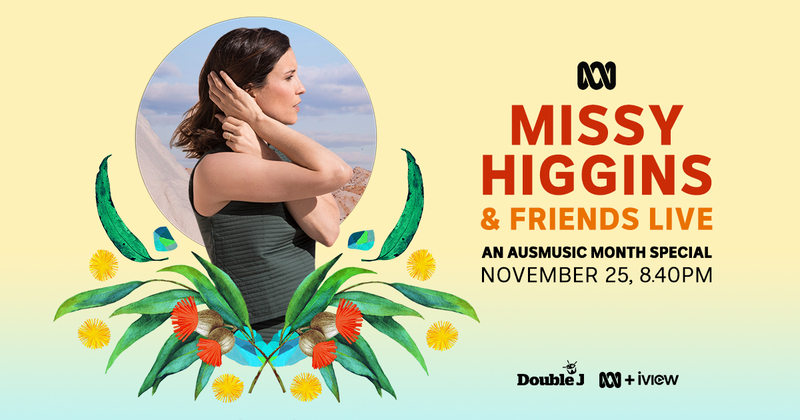 Tune in to ‘Missy Higgins & Friends Live’ this Sunday 25 Nov at 8:40pm on ABC TV.